The ensemble, which Václav Marek founded in September 1999, interprets dance and swing music from the 1930s and 40s. Over its time in existence, the ensemble has many performances under its belt as well as cooperation with the Klicper Theatre in Hradec Králové, the East Bohemia Theatre in Pardubice, Žofín Palace and the Semafor Theatre in Prague and the Týniště Swing Festival among others as well as foreign guest appearances in Nuremberg, Leipzig, Dresden and Brussels. The ensemble has also for example played at Prague Castle, on Czech Television, TV Prima and Czech Radio. The following have cooperated or cooperate with Blue Star: Zdeněk Svěrák, Jiří Suchý, Jitka Molavcová, Josef Zíma, Miloň Čepelka, Daniela Šinkorová, Aleš Cibulka and Michal Stejskal. 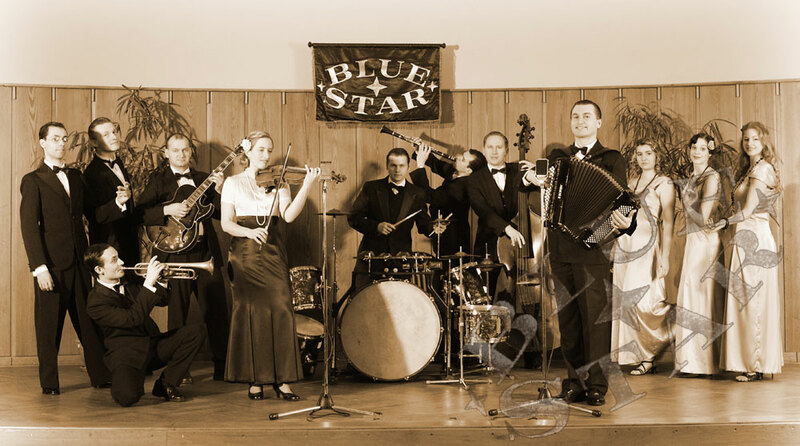 In January 2006, Václav Marek and his Blue Star released a debut CD called Opus One (christened by Táňa Fischerová, Jiří Suchý, Professor Pavel Pafko) and in October 2008, the second CD called A Few Wishes (christened by Jitka Molavcová, Jiří Suchý, Professor Pavel Pafko). The special edition CD´s also included a booklet with memories of Mr Václav Pokorný (composer and major music arranger of R. A. Dvorský Orchestra) dedicated to his 90th Birthday. The third CD, Swing and Dance Music 30 - 40s, was issued in November 2011 and includes tracks of Anglo-American origin (the godmother was among others also Pavlina Filipovská). ... for the audience of today to have as much fun as audiences past.